Italian Gambit - Chess Gambits- Harking back to the 19th century! The Italian Gambit arises after 1.e4 e5 2.Nf3 Nc6 3.Bc4 Bc5 4.d4! ?, leaving Black with the option of capturing on d4 with the c5-bishop, the c6-knight or the e5-pawn. This line was the main recommendation of Jude Acers and George Laven in their book Italian Gambit and a Guiding Repertoire for White- E4!, which offers an impressively wide-ranging coverage of 1.e4 e5 2.Nf3 Nc6 3.Bc4 lines in general. There are a few holes in their coverage of the Italian Gambit, though, which I aim to address. Most recent sources on this gambit idea have focused on the move-order with 4.0-0 Nf6 5.d4. In this case, 5...exd4 is not particularly strong because White can head for the Max Lange Attack with 6.e5 d5 7.exf6 dxc4 8.fxg7, followed by 9.Re1+ and 10.Bg5, whereupon king safety is a significant problem for Black. Black also cannot consider 5...Nxd4 because 6.Nxe5 is very strong for White. The main downside is that Black can side-step the gambit with 4...d6, whereupon White must go for a more positional approach, since 5.c3 Bg4 6.d4?! exd4 leads into a bad line of the Scotch Gambit for White. If White plays the immediate 4.d4 then Black cannot get into that line. One significant issue with the 4.d4 move-order is that 4...Nxd4 is playable because after 5.Nxe5 (probably still best), Black has 5...Qe7!. The right response for White was identified by Dc Gentle at the Avler Chess forum, namely 6.Bxf7+ Kf8 7.Bxg8 Qxe5 8.Bd5, which leads to dynamically equal positions. This leads to a line of the Scotch Gambit: 1.e4 e5 2.Nf3 Nc6 3.d4 exd4 4.Bc4 Bc5, which in turn usually leads to a Giuoco Piano after 5.c3 Nf6. After the critical 4...Bxd4, White normally exchanges on d4 immediately although 5.0-0 is also playable, which will usually transpose into the main line (5.Nxd4 Nxd4 6.0-0). After 5.Nxd4, Black should avoid 5...exd4?! which gives White a superior version of the Göring Gambit. In the 4.d4 move-order White has two independent options at move 6. 6.f4?! is dubious because White has not yet castled and Black can flick in a disruptive queen check at h4, but Jude Acers and George Laven made a strong case for 6.Be3! ?, which appears to provide White with sufficient compensation for the sacrificed pawn. This is the most common continuation, which after 6...Nf6, transposes into the line 4.0-0 Nf6 5.d4 Bxd4 6.Nxd4 Nxd4. 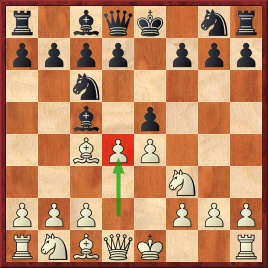 White can then choose between Rosentreter's 7.Bg5, and the main option 7.f4, which was favoured by Max Lange. Both options should provide White with enough compensation for the pawn, but 7.Bg5 gives Black more scope to simplify quickly into an equal endgame than 7.f4 does. White should generally follow up with f4xe5 followed by Nb1-a3, and will put pressure on the f6-knight with Bg5. Black will often aim to side-step this by castling queenside and allowing White to regain a pawn on f6 in order to open the g-file against the white king, and White often does best to refrain from capturing on f6, keeping the pressure on Black and aiming to organise a queenside attack. Black has an independent option of 6...d6 7.f4 Be6!?. Here I don't trust Jude Acers and George Laven's suggestion of 8.Bxe6 Nxe6 9.f5 Nc5, but Stefan Bücker's suggestion of 8.Na3 looks good enough to fully compensate for the pawn.